There may not be a single equivalent service to support the young person after transition. Adults' services focus on the young person as an independent adult. This change can be difficult to adjust to. Planning and preparing early will help make it a more positive experience and build confidence and independence for transition to adults' services. Every young person's development will be different, so plans and services need to take account of this. Working in partnership with young people and their families, start planning for transition from year 9 (age 13 or 14) at the latest. Help the young person choose one practitioner (a named worker) from those who support them to take on a coordinating role. The worker should act as a link to other professionals and provide advice and information. For many young people, transition plans will be part of their Education, Health and Care plan (EHCP). Other types of planning (including pathway plans for looked after young people) may be going on at the same time. Review and update these plans at least annually. This meeting should include the young person, their family, and all those who support them, either in person or via teleconference, videolink or report. Consider each of the Preparing for Adulthood outcomes when helping the young person to plan and set goals. Who should be the named worker? One-page profile - the young person's skills and character, what's important to them, how to support them in the best way possible. Their strengths, achievements, hopes for the future and goals. Information about their education, health condition, social care and communication needs, and EHCP if applicable. Preferences about parent and carer involvement, taking the young person's capacity into account. What would help the young person play a full part in their transition planning? Has the young person and their family got access to enough information to feel informed and make decisions? What will happen before, during and after the transition process? What support will be available before, during and after transfer? Different ways of managing their care and support, including personal budgets? Other sources of support and advice, including about their condition(s), how to access advocacy, and information, advice and support services? Where to get advice about benefits and financial support? What will help the young person and their family become familiar with, and gain information about, the adults' services they may get support from? inviting relevant practitioners from adults' services to the young person's review meeting. What information and support do the young person and their family need to help them understand and manage any long-term conditions as independently as possible? Is there a risk that the young person might stop using services when they transfer to adults' services? Talk about what might help them use the service or look for a different way to provide support. Transition from children's to adults' services for young people using health or social care services - NICE guideline (NG43). Transition from children's to adults' services - NICE quality standard. Preparing for Adulthood - expertise and support for local authorities and their partners. Transition Information Network - Council for Disabled Children. From the pond into the sea - CQC themed review of transition arrangements for young people with complex health needs from children's to adults' services. CAMHS transition - Young Minds resources on transition in mental health services. 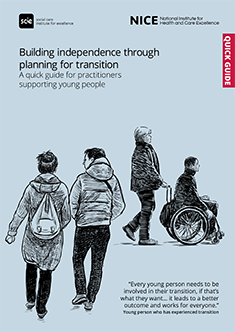 The Care Act: Transition from childhood to adulthood - SCIE resources. Care Act statutory guidance - support for local authorities to implement the Care Act; chapter on transition to adult care and support. Together for Short Lives - advice and support for children and young people with life-limiting conditions, and their families. Contact a family - information, advice and support for families with disabled children. This content has been co-produced by NICE and SCIE and is based on NICE’s guideline on transition from children's to adults' services for young people using health or social care services. We've created a copy of this guide that you can print and share.